In the early 1920's, a young J.C. Potter enjoyed making flavorful country sausage right on his family’s farm. The freshness and flavor of that “homemade” sausage became the basis of his dream to produce premium quality pork sausage for the public, using the same premium cuts of meat and flavor-rich spices. 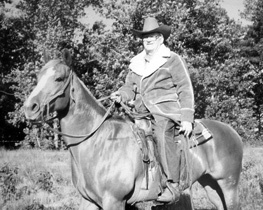 Late in the 1940’s J.C. and his wife, Alta, began making homemade “whole hog” sausage for their neighbors. Their door-to-door business changed to store delivery overnight. 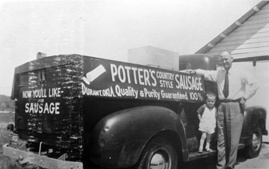 J.C. Potter’s dream was becoming a reality as he began delivering his sausage in his small 1950 model truck, with his proud promise “Quality & Purity Guaranteed, 100%”, emblazoned on the side. Over the years, the company grew rapidly. Through the 60’s, 70’s and 80’s, the company expanded operations and facilities to keep up with demand. 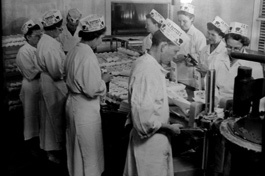 In addition to premium roll sausage, J.C. Potter began making pre-made sausage patties, breakfast and dinner link sausages, bacon, hot links, and breakfast sandwiches. These products offered consumers quality choices in the rapidly expanding market for convenient, flavorful, and microwaveable foods. In 1998, the J.C. Potter Company joined the Atlantic Premium Brands family. Atlantic Premium Brands is a group of specialty meat companies operating in the South and Southwest US. This affiliation provided resources for J.C. Potter to expand and grow even more. "Quality & Purity Guaranteed 100%"